Whether renting or owning, finding the best flooring for dogs is one of the most important questions in household upkeep. If you’ve just moved in or just adopted a dog and are doing this from the start, good for you! But it’s never too late to protect your floors. I have wood floors and a tile floor in the bathroom. Other folks may have wall-to-wall carpet or area rugs, laminated flooring or even concrete. Depending on what type of flooring you have, you may need a lot of protection or a minimal amount. 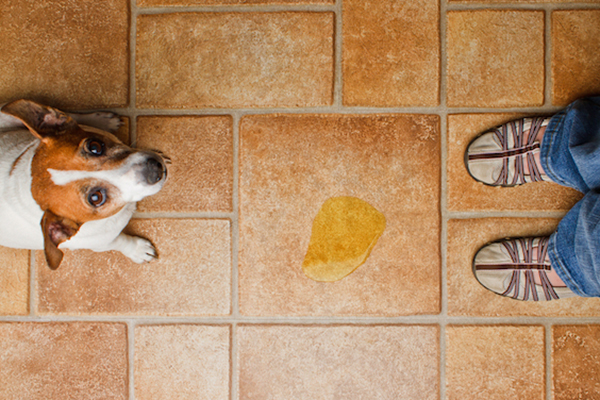 Tile is among the best flooring for dogs since it makes cleanup easy. Photography by Shutterstock. Carpet or large area rugs – Carpet and rugs can be the toughest floor types to clean because stains and smells can soak in all the way to the padding. Some carpets do come with a sealant already on them, which helps repel stains. Wood – A lot depends on if a wood floor is finished or unfinished. A finished floor may repel some stains but not entirely; an unfinished floor is more likely to absorb them. Laminate – The coating on these floors will dissolve from messes such as urine, and moisture can make laminate buckle. If you have a puppy or an older dog, it will be easiest to completely cover a laminate floor, even if it’s with carpet. Tile – Tile floors are beautiful (I sometimes sit in my bathroom and stare at mine) and they may be one of the best choices for dog owners if you can control what floors are put into your place. You‘ll need a sealant for the grout, however, or else any liquid messes will seep into it. Concrete – This type of floor is most likely to be found in a multimillion dollar penthouse in Manhattan owned by hipster thirtysomethings who think they’re being eco-friendly with this choice. That said, concrete floors are super cool with color mixed in and topped off with a thick sealant. This sealant should make this type of floor almost mess-proof. Think: What is the best flooring for your dog, specifically? So, you probably know what type of floor you’re working with. You also have an idea of the type of messes your pet leaves behind. Every pet is capable of having a mishap, I don’t care how well-trained they are. A pet may get ill or frightened or jealous (yes, they can get jealous) or any number of things. Or you may bring home that cute puppy in the rescue window. Or, surprise, your pet may get old. Most of the messes in my home occur because Hudson is old. Old dogs have a remarkable capacity for not hearing when you scold them and for hearing well when it’s dinner time. I’m pretty sure Hudson decided a couple of years ago that, because of his age, he no longer needed to do what I say and that it’s easier to go to the bathroom inside, especially when it’s hot outside. Hudson also throws up several times a day and night. Sometimes he eats it back up (ew, gross!) and sometimes I step into it when I get up to go to the bathroom at 2 a.m. The most common messes your dog may leave for you are urine; poopie; mud, water and other natural substances; ice melters, oil and other chemical stuff; and vomit. Cleaning up the mess is, of course, essential (unless it’s Hudson and vomit). And even really good floor protection solutions may let something seep through, so be sure to check under that protection if you see a mess. It’s more economical and just easier to use only one or two cleaners for any type of mess based on your floor type. Leave a few spray bottles with the cleaner in them around the place (up high, of course). One product that can be used on any type of flooring and speeds up the cleaning of liquid messes is Nature Miracle’s Pet Mess Easy Clean Up, which has sawdust that absorbs the liquid. In fact, Nature’s Miracle is what I use and I think is the best brand for cleaning any type of floor. Carpet/Area Rugs – You want a product that will deep clean so shampooing and vacuuming may be needed. Nature’s Miracle Deep Cleaning Pet Stain Remover (no vacuuming needed) or Bissell Carpet Shampoo are some examples. Wood – If your wood is unfinished, you’re going to have a heck of a time getting stains and, especially odors, out. The best thing to use, from my experience, is white vinegar mixed with water, one part to three parts. It cleans and neutralizes odors. If your wood is finished, vinegar can eat away at the finish. Enzymatic cleaners tend to be safer. Laminate – This type of floor is very sensitive (so, don’t criticize it within earshot). It isn’t very sensitive to cleaners (you can use almost anything) but is to urine and other acidic messes. Your best bet is to get any mishap up immediately. Tile – Tile loves a non-acidic PH balanced cleaner such as Ceramiclean Tile Cleaner. Steam is good for cleaning a large area. Concrete – Concrete can also be cleaned with steam or a multi-purpose cleaner such as Pine Sol. You can also use a mild dish detergent or baking soda. Okay. The floors are clean. Fido has done every possible bodily function and you’re cleaned his paws and any other necessary region. Now, to get down to the point of this piece: How to protect your floors! I wish I had loads of money to put tile floors in my apartment. But then, I could probably afford that New York City penthouse with the cool concrete floors. The following solutions are either temporary, which are mostly economical and quick to execute but may crunch under your feet, or permanent, which makes them more work up front and more expense but less obvious in the end. Temporary – While perhaps unsightly, heavy plastic covering that sticks, such as one of Plasticover’s products, will protect your carpet. Clear plastic may be a bit less noticeable than the white stuff. Permanent – If you put down your carpet yourself or can rip out the carpet and replace it, use a moisture proof pad such as Spillguard Carpet Pad under it. This will absorb messes and odors. In addition, use a spray such as Scotchguard for your carpet, which creates a barrier. It’s usually claimed that this is only needed once but you’ll probably have to apply it every month or so. Temporary – Vinyl tablecloths with a flannel backing work well for covering a large area, and they won’t slide. For absorption, try newspapers or paper towels on top. The idea is that you can easily scoop them up and replace them as needed. Permanent – A water-based coating such as Bona Mega will create a barrier to repel messes. It is best, however, to still clean any mess up immediately or use another one of the solutions that covers, such as a vinyl tablecloth, as well. You can’t permanently protect a laminate floor, so you’ve got to put something on top of it that can continually be replaced. The polyurethane coating on laminated flooring offers little help and cannot be covered with any kind of coating or sealant. Tile floors are easy to keep up if they’re installed correctly. A sealant can be applied, which will create a barrier between the tile and messes. Look for DuPont Stone and Tile Sealer (you want to seal the tile as well as the grout). Permanent – A permanent solution such as sealing the concrete is your best bet. There are some general solutions to protect your floors as well. Crating your dog when you’re out or blocking off areas of flooring are effective. You can also put booties on your dog when you go out and socks on when they’re inside, such as Power Paws Dog Socks. Pee-pee pads will work on any type of floor as long as your dog is trained to use them. Area rugs with a rubber backings can provide a moderate amount of protection, but wash them or replace them frequently. It’s easy to protect your floor from your dogs whether you rent or own. So, take my advice and don’t put it off as I did — start protecting your floors as soon as you move in and be diligent about cleaning up messes quickly. You’ll be happier with your home and more likely to get that deposit back. Tell us: What do you think is the best flooring for dogs? What flooring do you use? Thumbnail: Photography by Patryk Kosmider / Shutterstock. The post The Best Flooring for Dogs — and How to Protect Your Floors From Damage appeared first on Dogster.